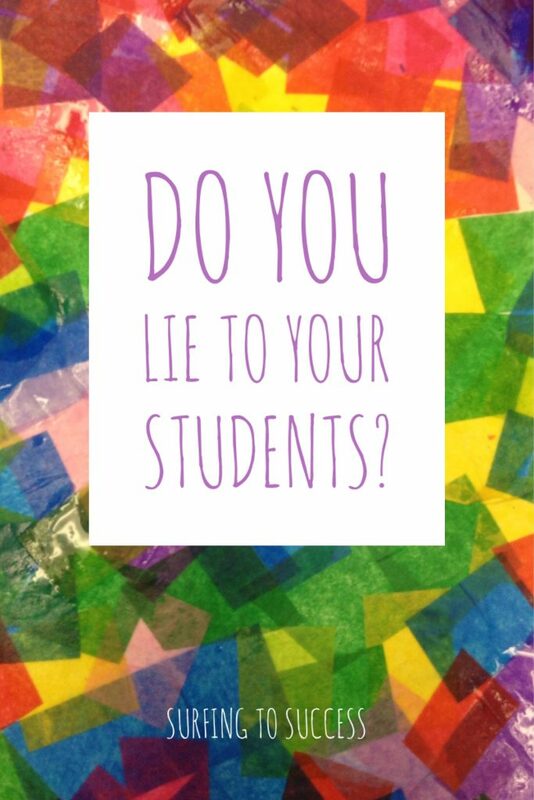 Do you lie to your students? Do you lie to your students? Most peoples gut reaction is a quick no. I challenge you to take a moment to think about this. Our students come from a variety of backgrounds and issues. Some of these we know about. Some of them we don’t. If a person is raised in an environment where their family members are less than trustworthy, they rely on teachers to learn that adults can be trusted. Some students have drug or alcohol abuse happening around them and parents that constantly tell them they’ll quit that don’t. Some students have abusive situations where the people that are suppose to take care of them are hurting them. Some students come from families where the stress on the family causes parents to make promises about later later later and later never comes. For these students, for all of our students, school is a safe haven. School is where they learn more than math and reading. School is where they have the chance to learn about consistency, honesty, respect, compassion, forgiveness and so much more. I’d like to give a couple examples to consider. While these examples seem small to people who do not have trust issues, they can be significant to people who do. It only takes one lie to make some people question everything you else you say in the future. a) say the child is fine and there is nothing to worry about. b) say that ambulances take people to the hospital where doctors help them. d) tell the students the child is in surgery. A student comes up and asks you if the tooth fairy is real. You are starting a new project and you want your students to be engaged. You colleague suggests that you write a letter to your students from the mayor saying that she needs their help and that she will pick their best idea to use. You’ve probably figured out that answer a is a flat out lie and answer d lacks tact. Answers b and c are options that aren’t direct lies. For Scenario 1, you may be wondering, why can’t I just tell my kids she’s fine. The hard truth is that she may not be. In all likelihood she’ll be fine but if she isn’t, the conversation to come is going to be much more difficult. I’ve lived the hard experience of talking to students about a students death and a teachers death. Words can not express how difficult those conversations are. The last thing you want is for the child to start repeating, “But you said she was fine.” For students with trust issues or anxiety, this can create even more uncertainty in a difficult situation. For Scenario 2, you may think, what is the harm. The thing is, the child that came and asked you that question probably came up to you because someone told them she wasn’t. Now the child is left either believing that their friend lied or you lied. Also, the child who has heard their parents say she isn’t real, now decides which of you to trust. While this scenario is not a huge deal for most children, for children with stressful home situations, who are weary about trusting adults, this is one more notch in the “they lie to me column.” Really, when it comes to beliefs, that is up to the parents to confirm or deny. My mom was mad at my second grade teacher for years for disclosing information about Santa. For Scenario 3, I challenge you to think about what message you are sending your kids. Sometimes I hear educators say things like, “It’s so cute that they believed me.” That just breaks my heart. I encourage fantasy. I encourage imagination. I believe you can do fun activities without directly lying to the kids. I want to empower kids. I want them to believe that they can make a difference. I want them to know that making a difference takes hard work and sometimes as set backs and that we keep going despite them. Rather than telling the kids that the mayor will read choose her favorite only to have some kids figure out that you really are choosing your favorite, why not make contacting the mayor part of the project. Connect it to something real. Have them write letters or make phone calls. Have them experience success and disappointment and problem solving. Or, if that isn’t the point of the project, just make up a mayor and the kids will know its all in fun. There are kids in your class that will say to people, “She’s making that up. She’s lying to us.” That same kid isn’t going to feel comfortable telling you that they are afraid of someone at home or that they don’t have food to eat for dinner. That kid needs someone to trust and the slightest hint that you aren’t trustworthy is going to stop them from confiding in you. I challenge you to consider your answers in the future. Honesty is my thing. It is my biggest strength and my biggest weakness. I know from personal experience that I lose respect for someone once they lie to me. I lose respect for people that call things ‘white lies’ and try to explain away why using the word lie to label something they said that isn’t true is ‘harsh’. I was lucky enough to grow up trusting one of my parents, my dad. Unfortunately, my mom endured an abusive relationship and made promises to herself and to me that she didn’t keep. I saw first hand how her boyfriend, an actual salesman, could charm people into thinking he was a great guy. Then he could go home and drink, scream, and rage. I learned first hand what the phrase ‘two faced’ meant. I learned quickly at an early age that people aren’t always who they seem to be. I learned to watch for signs. These lessons were something I needed for safety. I saw them as a matter of life and death. Any adult who lied to me, was someone not to be trusted. If you lied to me, I made sure never to be alone with you. How did I know you wouldn’t turn into someone like him? As sad as it is for me to think about how I looked at the world as a young child, it has helped me to form some non-negotiables for myself as a teacher. I will not lie to my students. I know I tested adults looking for someone I could trust and I came up wanting for many more years than I like to admit.